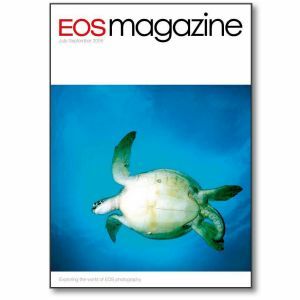 Add this issue to your photographic library for techniques on focus modes, flower photography, Canon's extenders, CF cards, underwater photography and Speedlites. Professional showcase Water colours. Despite 25 years’ experience under his belt and a clutch of awards to his name, Zac Macaulay still finds shooting underwater a considerable challenge. EOS in action Dan’s diary. Guardian photographer Dan Chung is an award-winning photojournalist, most recently taking the What The Papers Say Press Photographer of the Year award. In this regular series, Dan tells his own story behind the pictures. Picture style As picture editor of The Times, Paul Sanders is responsible for the visual style and content of the newspaper. His aim is to keep readers stimulated with inspired use of the very best images, which means sifting through about 8000 pictures every day. Sharp practice Do you know how many different ways there are to focus the lens on your EOS camera? If you only use one, it’s time to check out the options and match the mode to the subject. Easy does it! If you’re looking for an easy way to produce photographs with your Canon printer, simply install Easy-PhotoPrint from the supplied CD. It does what it says on the disk. Flower arrangements Vivid colours, varied shapes and a readily available supply – there’s a bunch of reasons why flowers make brilliant subjects for photography. At this time of year, there’s no problem finding subjects or inspiration. But what about the tools and techniques you need to pull off the perfect flower shot? Ann and Steve Toon reveal all. Extenders at f8 Canon Extenders don’t fit all Canon lenses, and when used with certain lens and camera combinations the autofocus doesn’t work. David Newton tells you what kit works with what, and why. Speedlite zoom The zoom setting of some Speedlites alters as the focal length of the lens you are using changes. It’s all down to its clever autozoom feature. David Newton explains how it works. Card play If you shoot digital, you probably use CompactFlash cards to store your images in the camera. Simon Conway explains how the cards work, and what to look for when buying them.